After spending my Sunday afternoon pinning some major summer style inspiration I noticed that, not surprisingly, I've been loving lots of bright colors and prints - and also that Julia from Gal Meets Glam is pretty much my style icon. 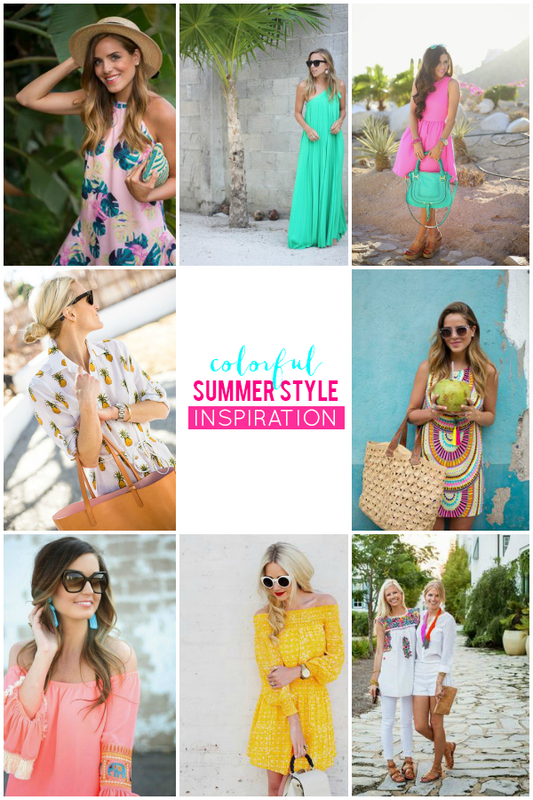 I've curated some bright, summer looks from my favorite fashion bloggers. I've also rounded up some of my must have colorful summer picks (for under $60) to help you get the look. I'll also share a few summer style style tips to help you recreate the looks for yourself. Bring on the colorful sundresses, oversized sunglasses & statement making accessories! 1 A trusty pair of white skinny jeans (paired with a white embellished top) is always chic. 2. When it comes to accessories go for color and statement making pieces- tassel earrings, beaded necklaces & colorful leather bags. 3. Choose a roomy tote that can take you from beach to brunch. 4. Trending prints include: palm & Hawaiian florals, pineapples, & jungle animals. 5. Tying hair in a topknot, fishtail braid or accessorizing with a straw hat is the perfect way to combat humidity and frizz. Now, for a few of my favorite colorful summer pieces (under $60)! What is your favorite color to wear for summer? I've been gravitating towards neon pink and bright yellow! Amazing pieces. I love summer fashion so much more. It's the only time of the year where I tend to wear more prints and colours. ALL of these Summer style inspiration outfit pieces are pretty. My favourite three out of the styles above are the Little Pink Dress, The Peach Embroidered Dress, and the Yellow Off-The-Shoulder Dress. Great roundup! I love these looks. I can't wait to start wearing more bright, fun colors this season! Those neon sandals are from Old Navy? What a steal!